A hungry elk already known to raid rose bushes has stolen a bicycle from a garden in Sweden. Bjoern and Monica Helamb, of Vuoggatjalme, said the elk had regularly visited their garden to eat their roses over the last decade. Fed up with the intrusion, and blooming destruction, the couple decided to take action. They placed a bicycle in front of the flowers as their front line of defence. "We thought we would at least protect our favourite roses from her appetite by making it harder for her to get to them," Bojern Helamb told the Associated Press. But their efforts were to no avail. 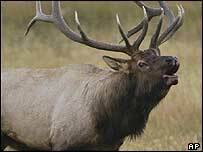 The elk, dubbed Droopy Ear, leaned through the bike frame to get to the roses and ate away as usual. "Then she disappeared, with the bike hanging around her neck," Mr Helamb said. The couple found the bicycle about 500 metres (1,640 feet) from the house, bent and damaged beyond repair. Following the bicycle incident last week, the Helambs employed a different tactic when Droopy Ear made a return visit over the weekend: they chased her away themselves.